How Much is My Legal Case Worth? 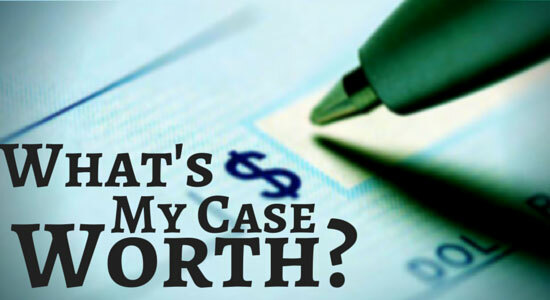 Unfortunately, there's no formula we—or any other law firm—can use to accurately predict how much your case may be worth. Every case is unique, and the worth of each accident claim must be considered on a case-to-case basis. In fact, it would be wrong to give you even a rough ball park figure (and we caution you not to put your trust in anyone who does). While we can't answer the specific question, "What compensation can I get?" with a number, our legal team can help determine what types of monetary damages you're entitled to for your injuries. When you hire our law firm, our accident injury attorneys will get to work immediately. Our legal team goes to work obtaining details about your accident, as well as paperwork related to your injuries. We also assign an investigator to your case to gather crucial evidence. What Compensation Can I Get? We can't tell you the amount of money your legal case could be worth, but we can tell you what you'll pay if we don't get money for you: Nothing. You've heard it in our ads, and it's a promise we've kept since 1982: There's no fee unless we get money for you. Call today for a free case review.